I haven't posted for a week. It seems very trite to berate myself for having done only about twenty rows of the second Madeleine Tosh ruby sock when many people have lost everything in the bushfires around Sydney. These fires are still burning and will burn in mountain valleys for weeks unless we get substantial rain, which does not appear likely. Fire fronts cover hundreds of kilometres and thousands and thousands of hectares have been burnt. My son and his wife are now living with her mother in the foothills of the Blue Mountains. Above them on the lower mountains around two hundred homes were obliterated. They actually live in what in normal times would be called a suburban area. With the unseasonable heat, the extra dry conditions and the the appalling winds we have had, there is no such thing as safe suburbia. Look at the 40 destroyed cars with another 37 badly damaged, in the car park of the Olympic Aquatic Centre. That's a car park I have parked in dozens of times, about ten minutes from here. 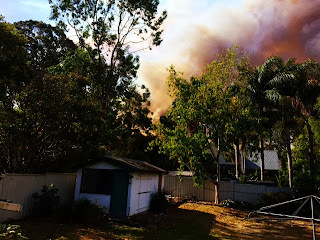 This picture was taken from her backyard a few days ago and there is another fire in the area tonight. That is far too close for comfort. They have spent today installing a more elaborate sprinkler system in preparation for another three days of heat and high winds before a possible cooler change and hopefully some rain on Wednesday. There has been almost no rain here since June. I have friends on both roads leading over the mountains. They have lived there for years and have experienced fire before but this seems different to them. The mountains are like a home to me. I feel very much at home there and would love to live there. Mum and Dad grew up in Lithgow. Dad was a history buff who knew many little bits of mountain history and could go to many places the tourists would not see. I think I have inherited his love of the place. Even Mum who had a deep fear of snakes and spiders would tell of picnics in almost inaccessible places around the mountains at the back of Lithgow. As children, we were taken to many of these places and my sons have inherited my love of them. The ZigZag railway, due to reopen in a few days has been wiped out with rolling stock and parts for renovations destroyed. My grandchildren walked those tracks only a few weeks go and ere amazed at the engineering. Dad grew up at Oakey Park at Lithgow. Much of that was burnt a few days ago. What annoyed me then was the poor reporting of this. I think the Sydney Morning Herald has dumped most of its subeditors over the last few months and spelling and grammar standards have fallen badly. Oakey Park has an E in it. Today the Herald had something like,"there was over a hundred fires burning." Something like this is in almost every edition. So not much knitting and lots of heart ache even though I don't think I know anyone who has actually lost anything yet. It was simple.to make. Mix one cup of Greek yoghurt, a pinch of salt and 250 gm flour together. I put on a disposable rubber glove and did it by hand. It took a few minutes to all come together. Then I kneaded it a bit and covered till I was ready to use it. I often forget yoghurt in the fridge so I bought the smallest Greek yoghurt I could find, 200 gm. It needed a couple of tablespoons of milk to make it up to a cup measure. Divide into eight portions and roll out as thinly as possible on a floured surface. This was quite easy as the dough was pliable. Place in a pan with a bit of oil or spray. On half of it put baby spinach or silverbeet and some cheese. I used feta but I guess something soft would also work. 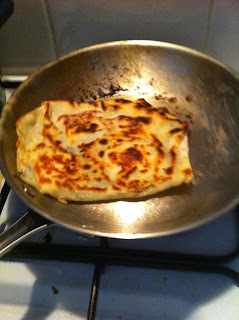 Fold the other half of the dough over and press down all round. Cook till one side is brown and the flip to do other side. 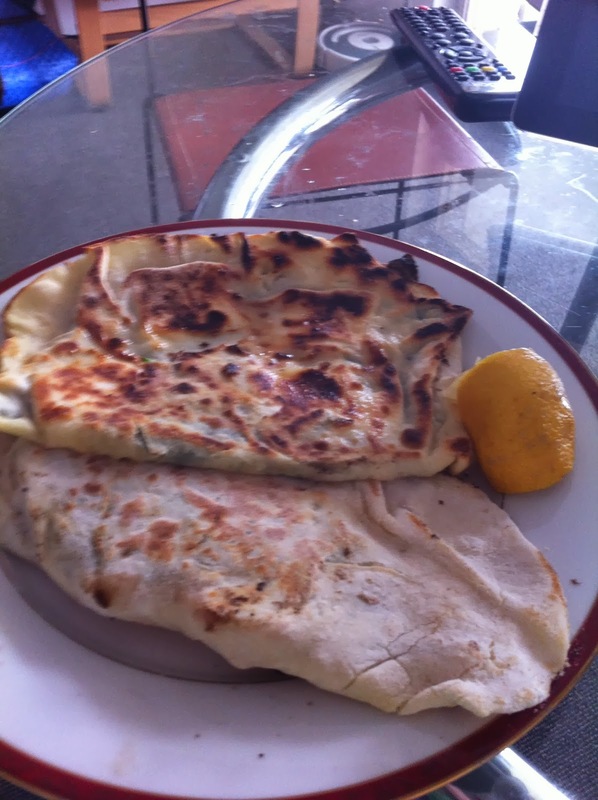 The darker one here has spinach and feta in it, the lighter spinach and some shaved ham. I think a mince mix could be nice too. Serve with a wedge of lemon. I did two and now have six small balls of dough frozen waiting for another time. Two this size was almost too much. I've been making squares from the book of motifs a couple of posts down. Just something to do with leftover 8 ply yarn. I would like to try most of the patterns but am not pushing myself. This one needs some serious blocking to make it square. The pattern was easy and quick. I would like to see charts and not just words in the book, but I guess this would probably involve paying more money for it. 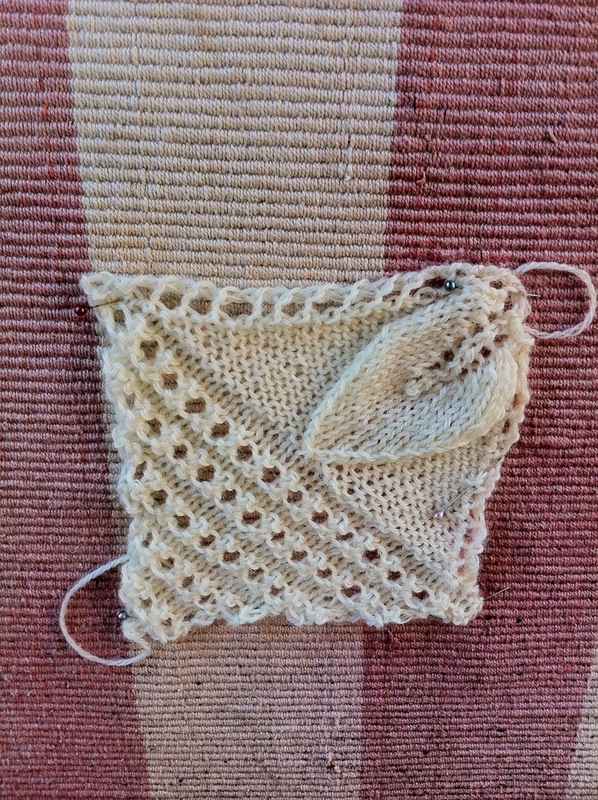 The square here is lacy leaf. I was reading Rosered's blog over here. She has just finished a beautiful blanket as a gift for her nephew and his bride. She just scraped in at the deadline to have it all assembled. I remarked to her that my mind seems to have blocked that bit out. I can see the squares and I can envisage them assembled. I don't see the bit in between. I suppose I'll face that hurdle when I get to that point. Scroll down Jane's blogpost and you will see see she is working on another big project with a deadline finish. Congratulations are in order there. 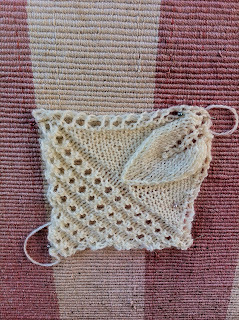 This square is full of butterflies resting lightly on the yarn. Another easy pattern to do. The yarn for both was some leftover Cleckheaton Country and I'm using 4 mm needles. I did this as I sat on the balcony in a cool breeze after lunch a few days ago. No cool breeze yesterday when the thermometer climbed to 37° C here. I actually found it quite comfortable. It's far too hot for October but I closed everything on the northern side of my place very early in the morning. Blinds and windows. The house stayed very comfortable. I guess that's because while it was very hot outside, we haven't had a run of hot days to heat the bricks to act as a heat sink. Daylight saving adjustment seems to have knocked my sleep schedule around quite a bit. I get one great night and then several progressively worse. I suppose things will sort themselves out in time. Tomorrow is my monthly outing to the Southern Highlands. I made this salmon pie to take and also some salad. Dressing is separate in a jar and tomorrow morning, all I have to do is transfer three containers from fridge to insulated bag and add two freezer blocks. This salmon pie is my third square this week. The recipe comes from the mother of one of my DILs. I haven't made it for ages and then thought it was easy, tasty and should be fine to transport. J. made herself and the family a recipe book about fifteen years ago and the recipe is in there. Here it is. Half pack of Jatz biscuits, crushed and spread over a 23 cm pie plate. Pour the mix carefully over the crushed biscuits in pie plate and bake in moderately hot oven for 35 minutes. I cooked it at 190° although the recipe suggested 210°. 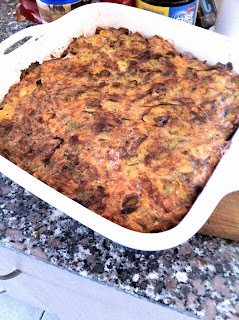 I also cooked some leeks in the butter and cooled them before adding to the mix and used a fourth egg as my square dish here is bigger than the pie dish suggested. 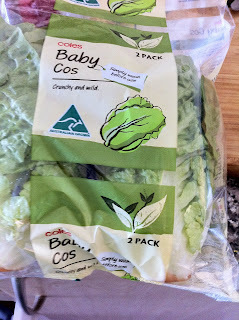 I wonder how much the producer is getting for these baby cos lettuce. The pack says product of Australia. They were very fresh and crunchy and I'm making a salad to accompany the salmon. 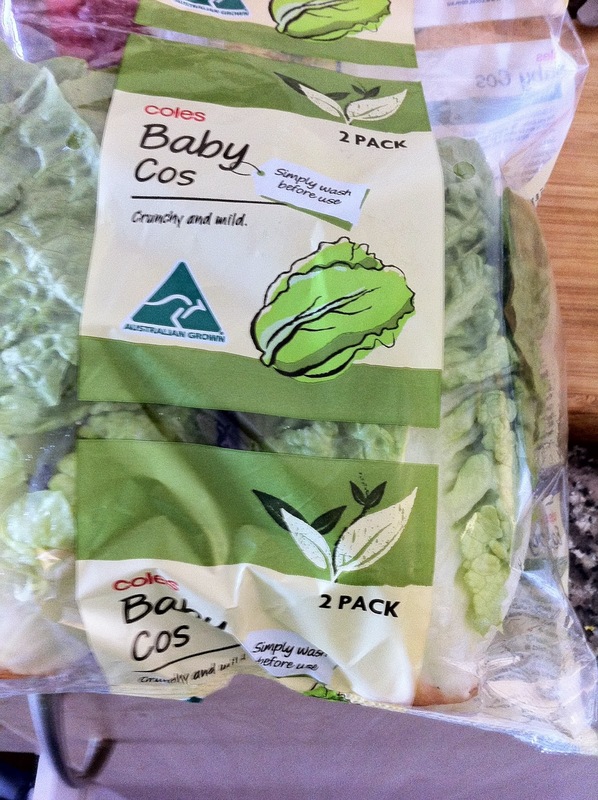 Two firm, crunchy baby cos lettuce cost me $1.50. Labour, packing, and other associated costs won't return much to the grower. The salad dressing is unusual. A couple of tablespoons of red wine vinegar, the zest and juice of a lemon, half a cup of good oil and three tablespoons chopped capers and finally a couple of teaspoons of Dijon mustard.. I used about half that many capers. Put in screwtop jar, tighten lid and shake well. I've decided that the afterthought heel is not really an after thought at all. It requires planning, marking, undoing yarn, picking up stitches, knitting heel. Not much in the way of afterthought there. 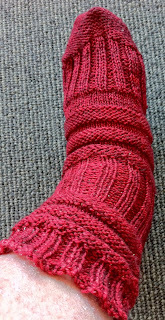 This is the Mojo sock (Rav link) which I have been doing in Madeleine Tosh sock yarn, colour Tart. The white line is where the afterthought heel will go. 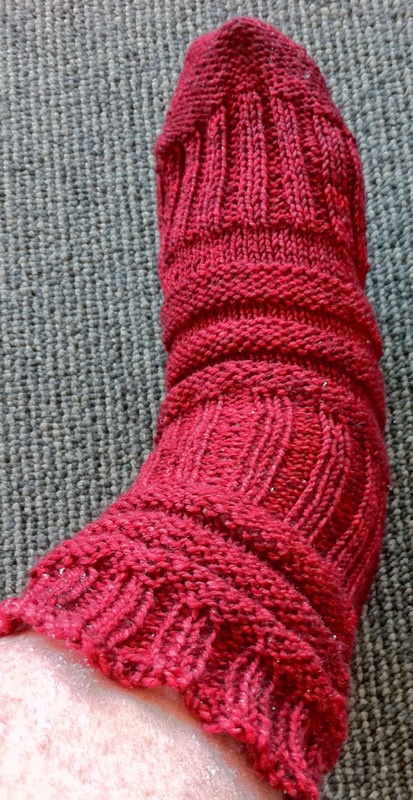 After I finished the sock, I came back, picked up stitches above and below the white yarn and knitted the heel. It made a very odd looking sock indeed. The rows of bumpers, five rows plain, five purl, repeated all several times totally changed the shape of the sock with the different tension introduced. I thought I had never seen such an odd looking sock till I remembered the one I did years ago when under a fair bit of stress. I turned two heels on the one foot. That was odd indeed. However, the sock is very comfortable and fits well. Now for the second sock which is a fraternal twin. 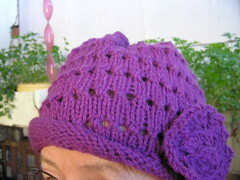 Same yarn but different configuration of stitches. This one is turned inside out after the toe is complete. The second sock is the normal stocking stitch. Today has been pleasantly cool, unlike yesterday when the temperature dropped drastically here in the middle of the day and it was quite cold. That was in itself a contrast to the previous days of fire bans and temperatures over 30°C with enormous gales. To have no wind has been very restful today and I sat on my balcony in the sun and knitted this sock this morning. I had lunch out there too, but then the sun went and I became chilly, so came inside. The chicken with maple syrup, mustard and rice wine vinegar which is detailed in the post below did me several meals. It kept well and I had some both hot and cold. 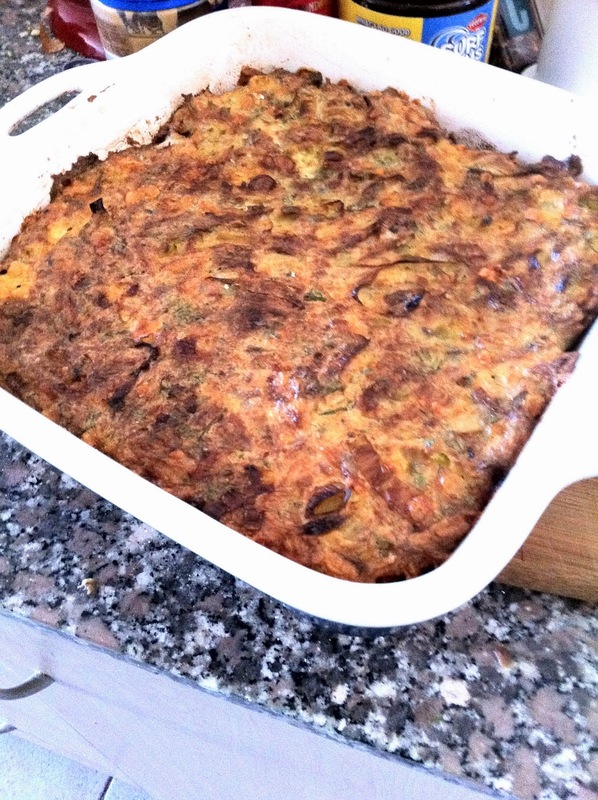 I'll repeat this recipe, it was good and I enjoyed it. I've had it with salads and with hot vegetables. Good whichever way i served it. Very simple, it could hardly be easier to prepare. I bought this book as part of the Amazon voucher which was given me by one son and daughter-in-law. Book Depository has it more cheaply but the voucher covered the shipping too. There are hundreds of squares inside. I thought it might be interesting when resting between more major projects to do a square at a time. 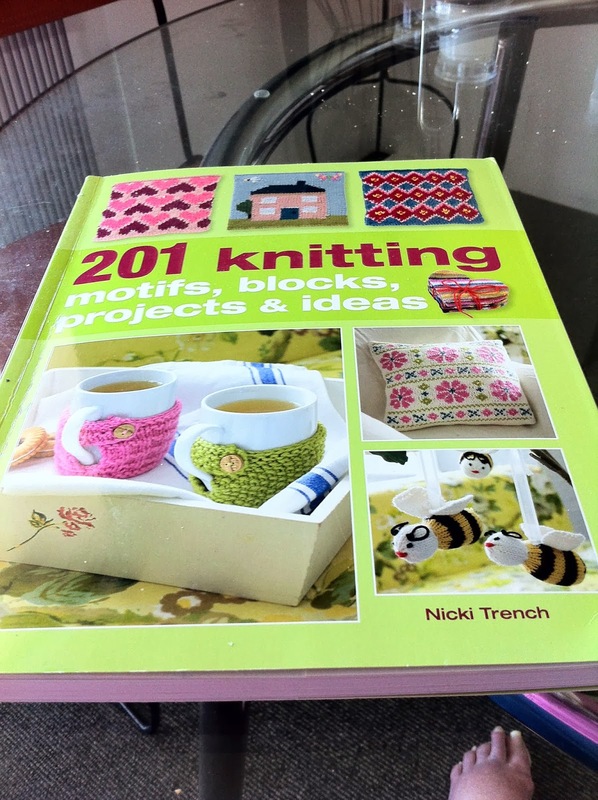 If done in same weight of yarn, they should(!) be the same size and could make a blanket. That's the plan, anyhow. There are many projects of different sizes and complexity as well. A good resource book for the shelf. 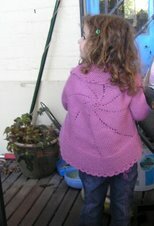 The little mobile of bees which you can see on the bottom right looks like a fun knit to do. There are cushions and bunting and gifts and more.